Support for Windows, MAC and Linux,Android.Supporter 32 and 64 bit operating systems. No adapters needed to get it working, No more DB-9 Adapters. The standard formerly known as RS-232 or RS232 became EIA-232 then TIA-232. Most of the world still calls it RS232 but many names are used RS-232D or EIA-561 defines the pin assignments for using RS-232 with RJ45 connectors. 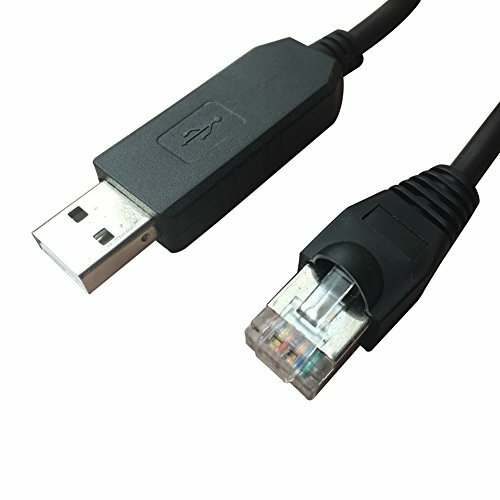 For an RJ45 male connector, the one you'll find at both ends of a Cat6 cable, pin 1 is the left most pin when you look at the connector with the tab up and the cable going away from you. Perfectly replace RS232 (DB-25/DB-9) serial port, connects from laptop/PC's USB port directly to a console port like a charm. If you have any questions about this product by Letotech, contact us by completing and submitting the form below. If you are looking for a specif part number, please include it with your message.